In January of 2011, my husband, Victor, was given a gift with the stipulation he was to use the money for gastric surgery. We began to explore the options and facilities near us. We found the cheapest facility would do the surgery for the $10K we had, but then because of required pre-surgeries consultations, tests, required supplements and a hospital stay. The total would be over $20K. We only had the $10K, and our insurance did not cover the surgery. My husband began internet searches and found BeLiteWeight. He researched the services, read the testimonials and announced he would be traveling to Juarez in March. I became angry, very ANGRY. My husband is a Lt. Deputy Sheriff and there are bounties on lawmen in Mexico. We did not speak for days and I even went to the point of contemplating a divorce. Part of the feelings was fear for his life, part was jealousy. I didn't want him to lose the weight, and not me. Our son, who is in the military agreed to accompany him and the airline tickets were bought. But, at the last minute, we found out our son could not use his military passport, so I was elated. My husband could not, would not go alone. I was wrong. He was still going. At the last minute, one of his sergeants told him, he would go with him. They left on March 24th, both leaving the week of their grandchildren's birthdays and both leaving two upset wives. Victor came home and the weight fell off. I was proud of him, but still envious. I wanted to have the surgery. Victor promised we would schedule my surgery as soon as we could. We had numerous medical bills from my cancer and his heart condition. I did not see it ever happening. But, in August of that year, we had a surprise. 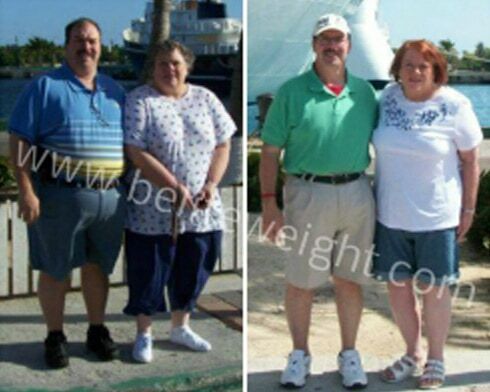 Victor had lost over 80 pounds and was looking and feeling good. We carried my parents out for lunch and they kept complimenting him. They were amazed at his progress and commitment. That night the phone rang, on the line was both of my parents with a gift of $5K for my surgery. Yea! We began trying to find the other money necessary for the surgery and trip. In a few days, we had it, with the help of some financing from BeLiteWeight. Looking back on this experience, I wish we could have had the surgeries sooner. The hospital in Juarez is wonderful. It is the cleanest I have even been in, the staff are great and the doctors, Dr. Jose Rodriguez & Dr. Elmo Aramburo (and team), are simply the best. I couldn't have asked for any better care. BTW, the Lt. and his Sgt. told everyone who asked that they were a chicken farmer and a truck driver. No so far fetched. Victor raises chickens for a hobby and occasionally, Malcolm drives a Ford F150.